THE HANGMAN HUNGERS FOR REVENGE! Laramie Falls is a ghost town, abandoned when the gold mines went dry. But sometimes, late at night, a haunting whistle can be heard coming down from Gallows Hill, and all who hear it know that the Hangman won't rest until someone is lying stone cold dead in a shallow grave! The Gutshot Posse is getting ready to saddle up for OwlCon 2004 at Rice University with a new Gutshot Adventure: The Whistling Hangman. "We've been working on this adventure for a while now, wracking our brains to come up with something fun and scary for a change of pace," said Gutshot co-creator Mike Mitchell. "I think we've really outdone ourselves on this adventure and the players should really enjoy it." Erik Cockrum and Cameron Orwin helped Mitchell work out the details on the back story for the adventure, and Paul Mauer helped with some specific encounters. "It's been a real group project," Mitchell said, adding that he hoped the extra work would pay off with a scary, fun adventure for the gamers at the convention.. "The Posse members really went beyond the call of duty to help me with this adventure." The game centers around the ghost of a hanging judge who is haunting a ghost town. The players have to sneak into town on Halloween night to search for hidden treasure... and try to get out alive! Mitchell cited classic Jonah Hex comics -- published sporadically by DC Comics since the 1970s -- as his inspiration.for this particular adventure. "Jonah Hex, especially as written by Michael Fleisher, was the best portrayal of the Sergio Leone Spaghetti Western ever captured in comic book form. It was very gritty and very real," Mitchell said. "Those were some of the best comics ever written, and I'm definitely rereading my collection for inspiration in this, and other adventures." The original Jonah Hex comics maintained a creepy atmosphere without resorting to blatant supernatural elements. The stories were firmly grounded in realty -- a theme which current incarnations of the character have not strictly adhered to. "The more recent versions of the Hex comics have read more like Deadlands adventures," Mitchel said referring to the popular horror/Western Role Playing Game. "I think Deadlands is very cool, but that's not the atmosphere we want to capture for the Gutshot series. Nevertheless," he added after a pause, "a few supernatural elements every now and then won't hurt." The adventure was originally written to be played on Halloween, but had to be cancelled due to scheduling conflicts. The game will be debuted at OwlCon in Houston, Texas (visit www.rice.edu/owlcon/webpages. for directions). The game is open to all players -- no prior experience is required, and all miniatures and game supplies will be provided. The game is limited to 12 players, so a sign-in sheet will be available at the con. Likewise, you can contact Mike Mitchell to reserve a seat in the game: mmitchell@hawgleg.com. 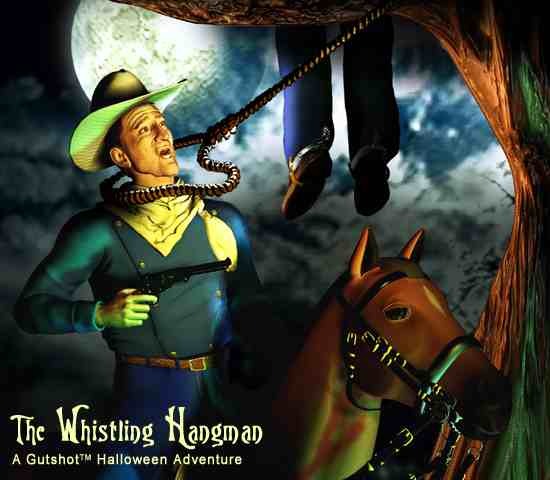 Like other Gutshot adventures, "The Whistling Hangman" will be available as a free download once the game has been published. It will be provided as a PDF for use with the Gutshot combat system. The core rulebook will be available in 2004.